Thousands of miles away, and over 100 years ago, an interesting trail of events was put into motion. These events did not concern us We were completely unaware of them. Time, however, has woven these events into our colourful history and has brought us to this moment. Sir Richard, a wealthy philanthrophist, decided to correct this deficiency. The people of Paris would be given 50 fountains strategically placed throughout the city and, carrying out his plan, Sir Richard commissioned the well known French sculptor, Charles-August Labourg, to design a fountain. Labourg created this fountain in what may be described as the French Renaissance style and Sir Richard entrusted the casting into the hands of the firm of Fonderies d'Art du Val d'Osne. Sir Richard made the presentation to the City of Paris when the first casting was completed in 1872 But Paris did not hold this distinction for long. The elegant lines of this piece of Labourg's work are very appealing and, many cities then and now proudly display its charm with duplicates cast by Fonderies d'Art du Val d'Osne. A postcard photo of one of the "Wallace Fountains" in Paris. 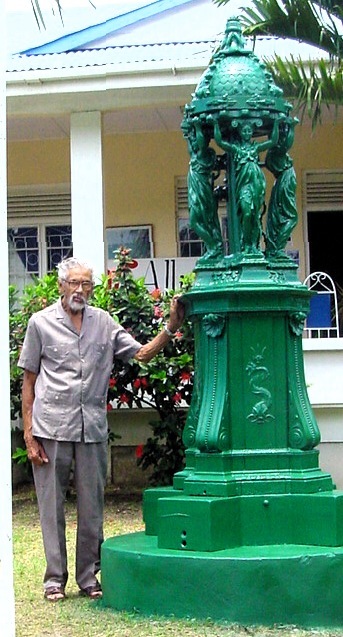 Alister Hughes at the unveiling of the Wallace Fountain in St. George's, August 27th, 2002. The re-built Wallce Fountain at its new, "temporary" site at the Alliance Francaise in St. George's, Grenada. 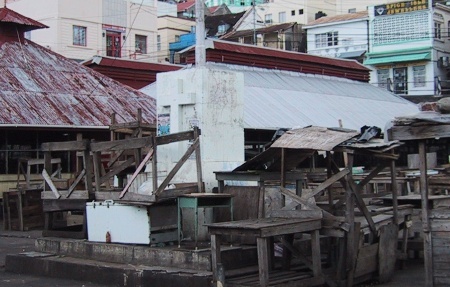 I have found no record as to when our Wallace Fountain came to Grenada nor the circumstances in which it was erected in the Market Square in St.George's. But the Fountain was there until early in the 1960s. Then, unfortunately, unaware of the tremendous importance of this treasure, the City Council had it demolished. 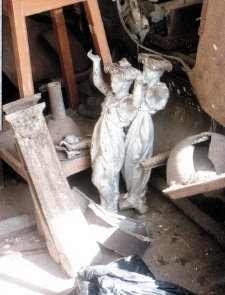 In my memory, one of the graceful ladies holding up the crown has always been missing but, though damaged by the demolition, I was fortunate to salvage most of the structure. Since then, the Fountain has had an important place in the Collection which carries the name of Cynthia, my deceased wife. It is a Collection dedicated to "salvaging the past for the benefit of the future" and the Custodians of the Collection are pleased that, once more, the grace and elegance of the Fountain will provide a visible milestone on our interesting voyage through history. Were it not for the dedication of a few people, Grenada's Wallace Fountain would still be languishing helplessly. First, there is Jean-Marie Picard whose invaluable research in France identified our treasure as a genuine Wallace Fountain. 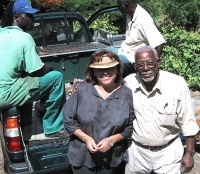 The expertise of Maria McClafferty advised the Custodians that the Fountain could be repaired in Grenada and she led the quest to Lincoln Ross. Above all, the dedication and drive of Margaret Hughes coordinated and guided this project. To her also must be given thanks that a vital relic of our past has been salvaged for the benefit of the future. in the Market Square, St. Georges. Follow the links here for more information about how you can contribute to this process and to the realization of the dream for additional pieces of "Cynthia's Collection."